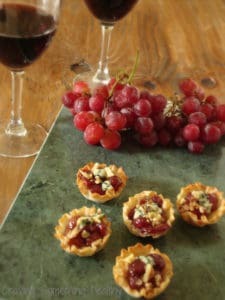 By posting this recipe I am entering a recipe contest sponsored by the California Table Grape Commission and am eligible to win prizes associated with the contest. I was not compensated for my time, and any opinions expressed about California Table Grapes are my own. I find myself buying a package of grapes almost every week when I’m grocery shopping, because California grapes are available nearly all year long (May-January). Mr. Craving starts to panic if we’re out (it’s the one healthy food he’ll actually run out to the store for on his own). I love them not only because they taste good (always perfectly ripe, and you always know what you will get unlike so many other fruits), but also because they are so easy to portion out for a snack. Take a big bunch if you’re craving more, or a smaller bunch if just a few will do. Love that about grapes! It’s so hard to portion out a banana or a peach. Grapes of all colors – red, black and green – are a natural source of antioxidants and polyphenols. Anyone who’s a red wine drinker knows about the potential heart benefits of drinking wine, but did you know you can get the same heart health benefits from eating grapes? 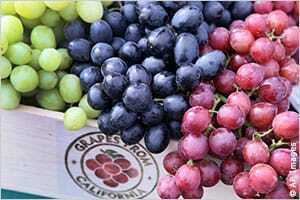 The cardio-protective compound resveratrol, is found in the skin of all grapes. In addition, a ¾ cup serving contains just 90 calories, no fat or cholesterol, and virtually no sodium. Grapes are also a great source of fiber, potassium, and vitamin K.
Like most people, I usually eat fresh grapes as a snack, so when the Recipe ReDux and California Table Grape Commission challenged us to come up with new ways to “Fall in Love With Grapes”, I wasn’t quite sure where to start. I have to confess I’ve never cooked with grapes before, but I discovered absolutely loved the taste of them sautéed. I love fresh grapes with blue cheese, but cooking them with a little bit of butter and a sprig of thyme takes the grape/blue cheese combo to a whole new level! Intensely sweet, caramelized sugars, with a nice deep flavor – who knew?! 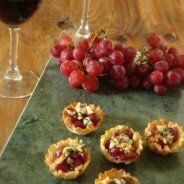 I think this recipe is just perfect for a fall cocktail party, and I know I’ll be making it for a Thanksgiving hors d’oeuvres. Preheat oven to 350 degrees. Place phyllo cups on a baking pan. Melt butter in olive oil, and add thyme, brown sugar, and grapes. Make sure grapes are dry, or they will splatter. Saute grapes for 7-10 minutes, or until they are softened and start to break down. Remove from heat, and let cool slightly. Mash a few of the grapes to release some juice, but leave most whole. 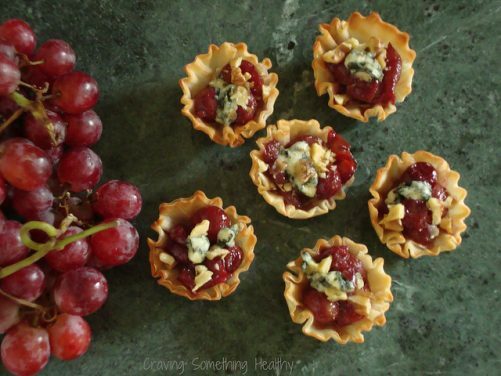 Place 1 tsp grapes with juice in each phyllo cup. Add a few crumbles of blue cheese, and a sprinkle of walnuts to each cup. Bake for 5-8 minutes until shells are golden, and cheese starts to melt. Remove from oven, and let cool a bit, and serve. Mini phyllo cups can be found in the freezer section of most grocery stores. Hope you try it! Let me know what you think! Have you ever cooked with grapes?